I quite like nice food and cooking but until now I have never heard of halogen ovens. So if you’re like me, you might want to know how does it work. It is essentially just like your oven, just smaller. 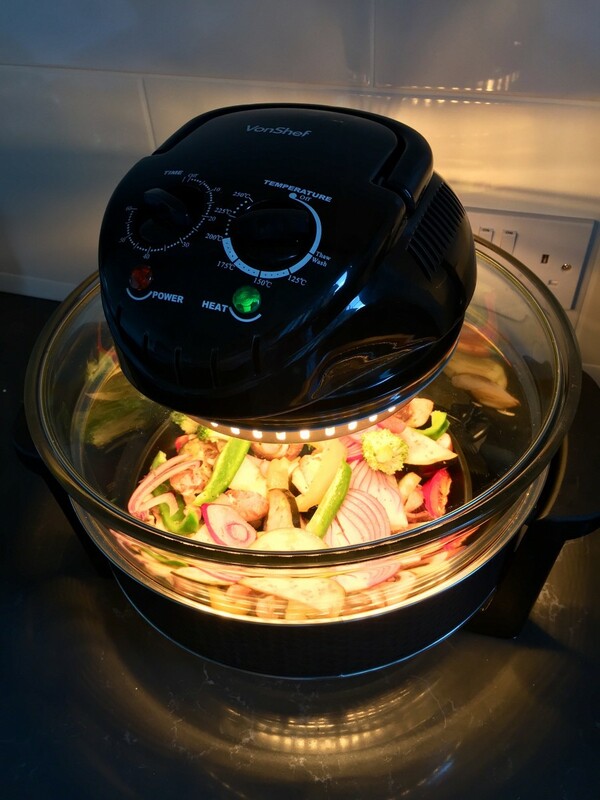 There’s one big difference though I’d like to highlight immediately: halogen oven cooks way faster then your regular oven so it saves energy (therefore, it’s more environmentally friendly) and money. It also uses electricity instead of gas, which can be produced on a renewable way . 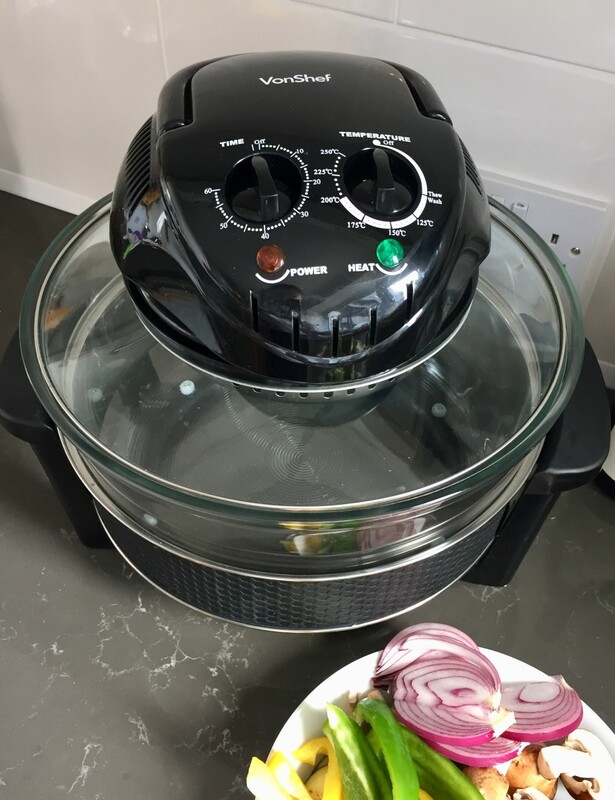 It is a multifunctional cooking appliance – suitable for grilling, roasting, baking, steaming, frying, broiling, reheating and defrosting. 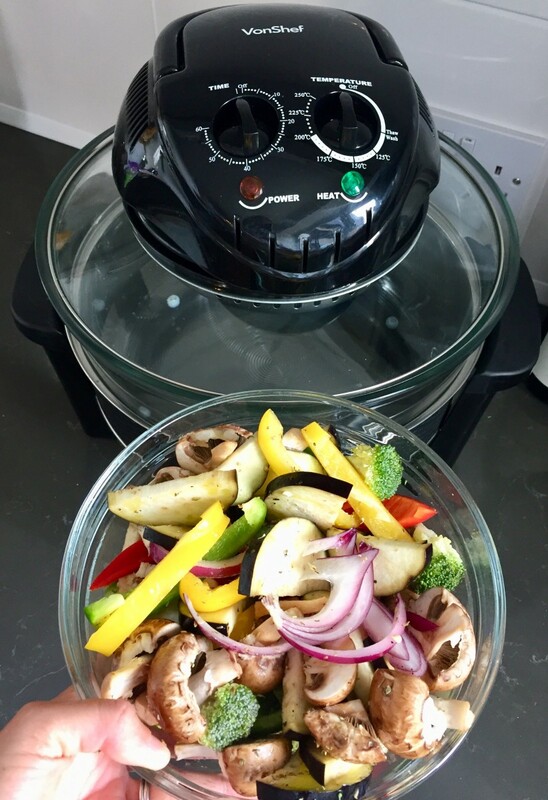 Because it cooks faster, it is able to retain nutrients and flavour better than a conventional oven. 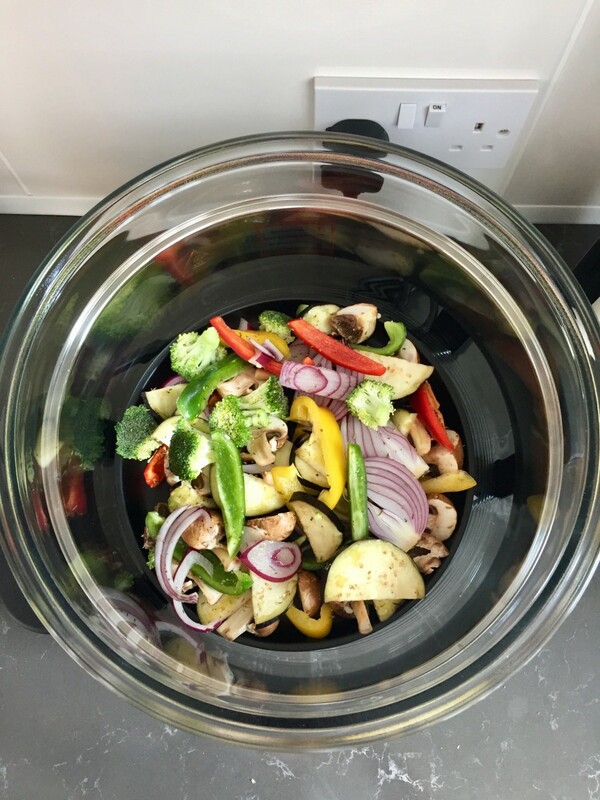 You can cook a lot of food with it, I’ve tried it with roasted veggies and bread, what I’ve leaned is that probably the only thing it’s not suitable for is slow cooking stews, soups and ragouts. When I say it’s uncomplicated to use it, I really mean it. All I had to do was to set the timer and the heat (which is the same as with the conventional oven). I decided to test it with a a safe bet meal: roasted veggies, what could possibly go wrong. So set the timer to 25 minutes, thinking that will do as it takes normally 30-35 minutes in the oven, and 200 Celsius. But I kept an eye on it, luckily, because they were all done in 20 minutes. Not only that, but the veggies were evenly roasted. I used a little bit of olive oil and dried herbs. 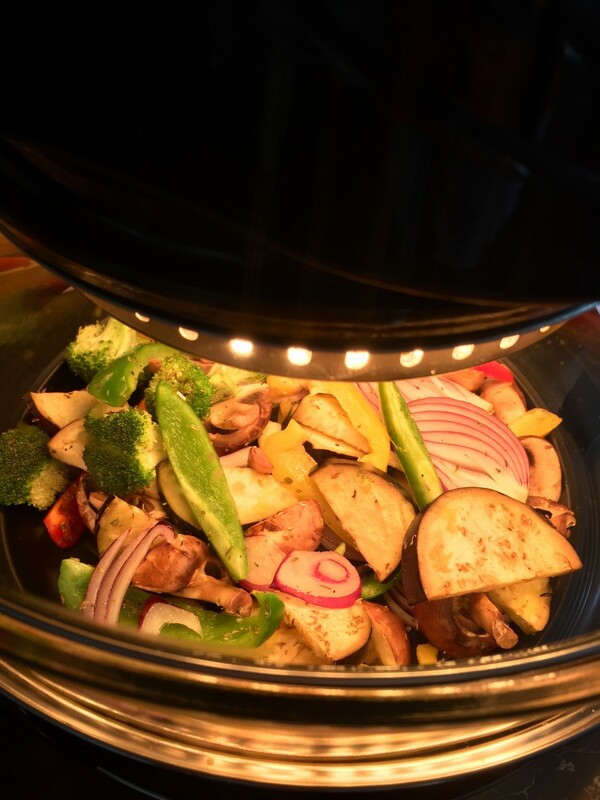 For roasting the vegetables, the halogen oven was perfect. I would say, the halogen oven did a way better job than my conventional oven, as I often have to scrape them off from the bottom of the baking dish. Cleaning is very easy: just wash the glass bowl and wipe down the lid with a damp cloth. (Never immerse in water! The “lid” is the actual oven bit, the heater!) That’s another big plus for me! And now you can win one of these VonShef 12L Halogen Ovens! All you need to do is enter below, good luck! The competition closes at 12:00 AM on Tuesday 26th of September 2018 and the winner will be announced via social media and notified via email. ONE person will be picked at random as a winner and the prize provider will send the prize directly to the winner as soon as is reasonably possible. (It is the winner’s responsibility to reply with their full name and address in order to receive their prize). I’d cook a nice beef casserole! It would be vegetarian sausage stew for our family. I’d love to cook a small roast dinner with potatoes and vegetables for my family of 3! Looks so easy and quick to use! Fab giveaway! 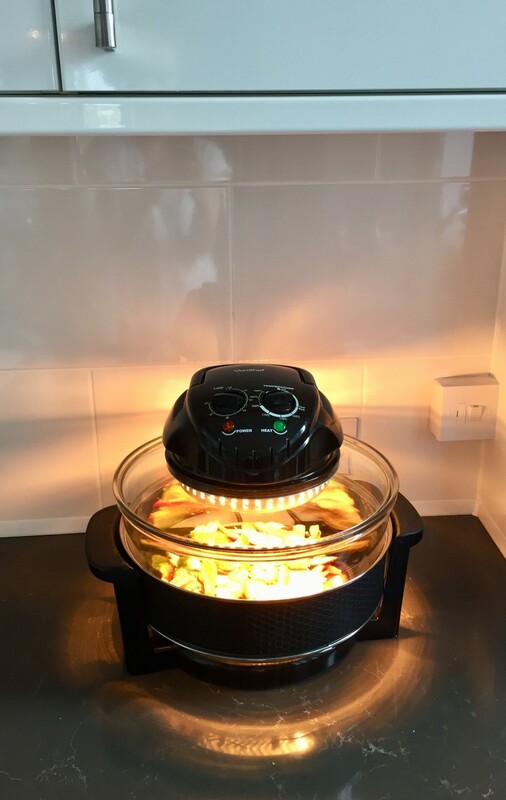 My mum swears by her halogen oven. Beef stew, as it’s starting to get into stew weather now! I’ve never heard of halogen cookers but the end Results look really tasty. Such a reasonable price too! Would love to make a nice warming stem in this! I’ve been hearing a lot of good things about halogen cookers. They seem very affordable and the food looks super tasty so I might have to look into getting one! I would love to try a halogen cooker, I’ve heard they are very healthy. I’d roast vegetables in it. a beef wellington type dish with roasted veg, yummy! 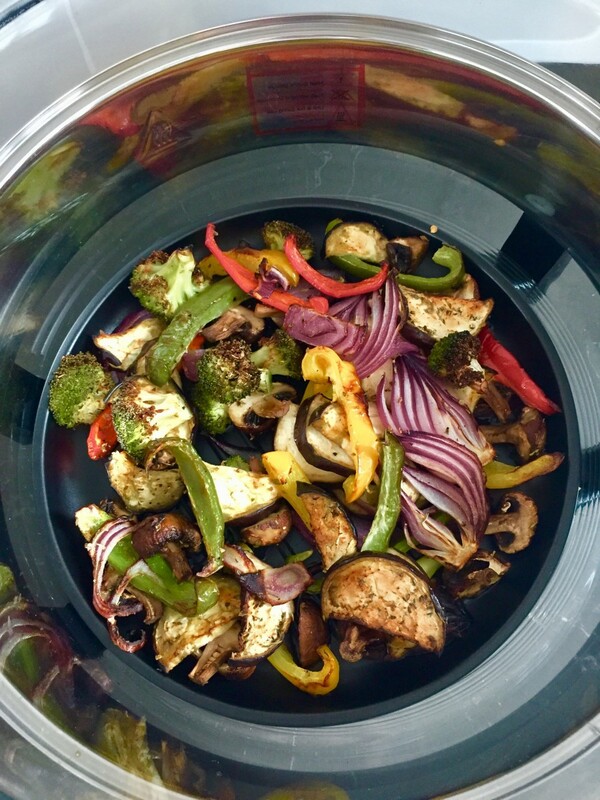 Roast veg is a good idea, I love aubergine. Or/and roast potatoes, and just about anything in breadcrumbs. it would have to be a roast dinner, iv seen these in action but never tasted the food out of it, but the food looks so good when its cooking in one of them. Sure I could cook lovely roast chicken or lamb with it! A lovely Roast chicken, l bet it will be so moist cooked in this! I think I would try a Pasta Bake. 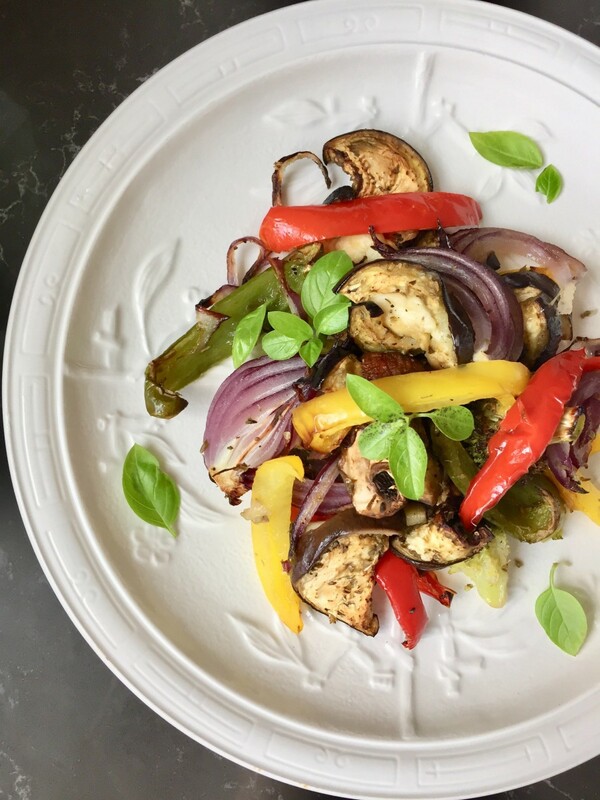 I would also try the roasted veggies, they look great! Baked salmon fillets with veg. I’d make a chicken casserole with lots of root veg. Delicious! I think I’d do some nice slow pulled Mexican beef! I’d start with a warming veggie stew. I think I’d start with something simple like cod and potatos. I hope I’d be brave enough to try a roast! braised beef, for a comparison with my usual oven. It would be a nice beef casserole.